Well, we are back from our holiday to the UK & I have to say 8 weeks is far too long to go without scrapping! So now that I am home I have been playing again & have come up with these items. Firstly is an ATC that I made for Linda from AC4U for a swap. The swap was that everyone picks a theme (Linda's theme was Places/Stamps) & sent it on a circular path - so Linda sent me 8 ATC blanks, I created one & sent it & the rest of the blanks along to the next person on the list. 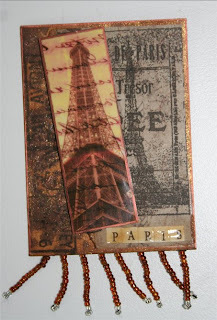 Since we had just been to Paris for the second time on our recent holiday, I decided to base my ATC on Paris & I used stamps & images that I bought from Crafty Individuals while I was in the UK. So here is the completed ATC I hope she likes it! 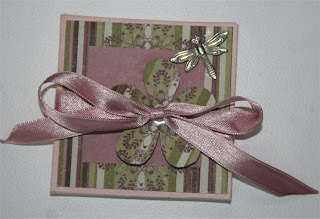 Next is a small mini book that I made for my friend Red as a "thank you" for her letting me borrow a set of her stamps. The general idea came from a class at my LSS, I used some left over Kaisercraft paper on it & finished it off with a silver dragonfly. 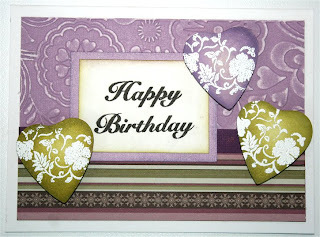 Lastly I was sitting there looking at the left over Kaisercraft paper & I thought I would use it to create a card. At our monthly cutters group meeting Lorraine very kindly gave us all a bag of precut cardboard hearts & our challenge was to use them on a project that we are to take in to our next meeting. So this is my completed card, thank you to my friend Marnie whos card she sent me gave me the inspiration to make this. Also, rather apt I thought, the background purple card that has been cuttlebugged was done one morning when I went to visit Lorraine & she let me use her embossing folders. I think it turned out really nicely, I might have to make a few of them for upcoming birthdays! Well thank you Miss Del, I'm just waiting now to see what you came up with :) .